Does shot string length matter? For years, shotgunners have been bombarded with two forms of data regarding the effectiveness of shotshell loads: Payload weight and pattern percentage points on paper based on a 40-yard range and a 30-inch target circle. There's no doubt a good pattern is required to bring down game birds or break clay targets, however, a third element is rarely discussed because expensive equipment is required to clearly see this phenomenon. The author evaluated the shot string length performance of various choke tubes by shooting at a controlled angle into soft, sun-baked mud. The third measurement factor is shot stringing. Ballistic experts and ammunition engineers study shot string intensely. The problem is there's almost no way of coming to an exact conclusion regarding the behavior of a given load, choke or gauge's shot stringing length. Shot string lengths vary greatly from different loads and choke configurations. Over the years, experiments have been conducted using basic tools to get a better handle on shot stringing effect down range. Bob Brister, a top ballistics evaluator and shotgunner, performed tests by towing a large sheet of plywood mounted on end to a trailer behind the family station wagon. Using sheets of paper, he fired test rounds at the rig while his wife drove past him at set distances and ranges. Brister discovered that when hitting the moving paper, the shot pattern print was always oval. In other words, Brister had visual evidence that not all of the shot was reaching the target at the exact same time. More recently, shotshell evaluators developed a large round drum that held a large sheet of paper, which when rotated by an electric motor and shot at, produced a pattern that extended almost all of the way around the drum. Incoming shot was stringing along and covering both sides of the rotating drum. We see shot stringing when waterfowling over water. I first noticed it in the early 1960s by way of a 23â'„4-inch paper case handload packed with 11â'„8-ounce of No. 5 copper-plated lead shot. When fired from my Winchester Model 24 side-by-side via the fixed modified choke, this load produced one solid dumping pile of shot on a low, incoming bluebill, with almost no stringing at all. Sea duck hunting offers the same kind of information if you're paying attention to the splash out over the wave tops on surf-skimming, fast-moving scoters. While one choke will string pellets for 50 feet, the next gun and choke will spatter every pellet downrange inside of a much tighter area. 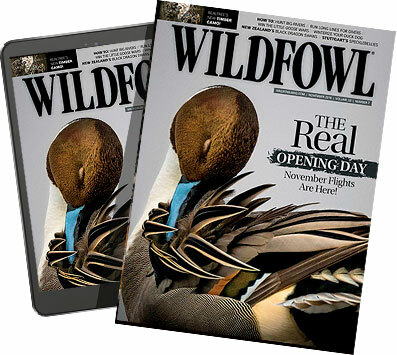 When I wrote about the effects of shot stringing from the research done during the Georgia Project (WILDFOWL June/July 2009), it created quite a buzz among shotgunners. The testing process showed less-constricted chokes tended to send shorter shot strings as opposed to the strings that went downrange through standard full or extra-full chokes. During normal evaluation, we only measure part of what makes a great load to drop ducks and geese. The common two-dimensional pattern percentage shows only what hit a 30-inch circle at a given range. That only tells one part of the story. Do we all need to start shooting more open chokes? In terms of hitting ducks and geese consistently, that is a good starting point. But in the real world, some people won't set aside old-school beliefs. Because most non-toxic shot is harder than common lead shot, the modified choke seems to be the tube that brings home the groceries. When asked which choke types to use, my response has always been, "When in doubt, shoot a modified." In the early 1970s, I was having a discussion about shotshell performance with Dave Fackler, former owner of Ballistics Products. Fackler indicated -- and I have never forgotten the conversation -- that some loads that look dreadful on paper kill ducks incredibly well. But why? Some of the answers could involve the choke constriction, or even the method used to control the payload upon exiting the barrel. In some cases, it is not the task of a choke, but wad strippers, claw-tooth designs or even the old tried-and-true Russian "jug" choke, which was once used in competition trap guns and on fix-choked shotgun barrels. I often use a small stock pond to determine the effectiveness of a shotgun's payload control system. I will shoot three rounds of a given load onto the pond surface at exactly 40 yards. The muzzle/target angle is about seven degrees. Shooting a Remington 887 and a Winchester SX-3, I selected different chokes to fire BB steel shot test loads. I watched the pattern spread and shot string length on the water's surface. The string might be as long as 14 yards, or as tight as five yards. Less-constricted chokes tend to look better in terms of overall payload control. I also evaluated patterns using soft sun-baked mud at the edge of the pond. Shooting at 40 yards through a set of upright stakes exactly 30 inches apart, I recorded the shot string and set a third stake set at the location of the last pellet to make contact with the ground. I fired 3-inch, 11â'„4-ounce No. 2 steel shot through a Remington 887 and a Winchester Super SX-3 with the chokes listed in the table. The angle of the shot taken into the mud surface had to be exact, because any change in angle would result in a different shot string length. The exact target angle was not easy to maintain, so the measurements achieved are approximate. While water and mud testing serves as an indicator of shot string length, the high-speed camera used during the Georgia Project was a much better tool. Still, shooting carefully into a prairie mudhole provided useful information. So, should the third element of measurement -- shot string length -- become a major factor in evaluating load performance?